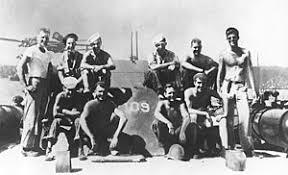 Torpedoman Second Class Andrew Jackson Kirksey joined the PT 109 crew. He often shared pictures and told stories about his son and stepson to JFK, who took to the likable Georgia native. Kirksey was one of two PT 109 crewmembers who died during the collision with the Amagiri. Kirksey is seated, second to Kennedy’s right.